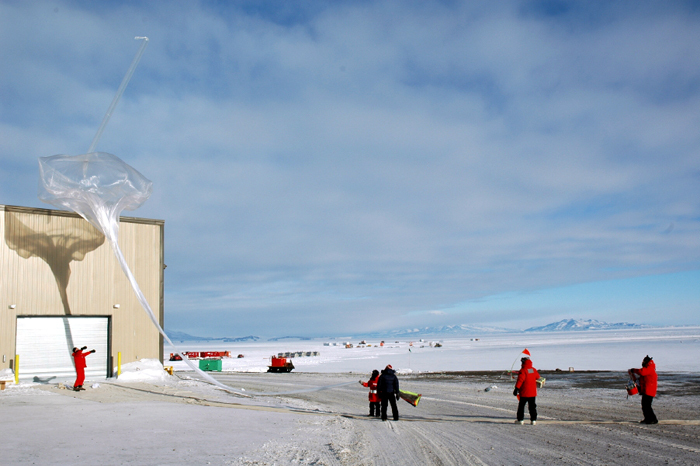 Photo Courtesy: Terry Deshler The University of Wyoming science team launches a balloon carrying an ozonesonde from near the sea ice at McMurdo Station in 2005. The group has measured ozone depletion for more than 20 years. The annual attack on stratospheric ozone above Antarctica began without the science team from the University of Wyoming, which has tracked the formation, development and dissipation of the ozone hole each austral summer for more than 20 years now. That’s because this year’s first flight since April to McMurdo Station , the logistics hub of the U.S. Antarctic Program , didn’t fly until Sept. 4 (Antarctic time), more than two weeks later than normal. Usually, the U.S. Air Force from McChord Air Force Base will fly several missions to McMurdo to carry people and cargo to the research station in mid-August, a period called WinFly, for winter fly-in. Pushing back Winfly — now called SpringFly — into September will save money, particularly in labor and fuel required to construct the temporary sea ice runway near McMurdo. Air operations will mainly be out of the Pegasus White Ice Runway , about 30 kilometers from the station, as the program consolidates its three airfields down to one. For Terry Deshler’s group , that means more than two weeks of lost data. “It means we will not have an ozone profile to characterize ozone above McMurdo prior to the start of ozone loss, which begins around the first week of September,” said Deshler, principal investigator (PI) of the project and a professor in the University of Wyoming’s Department of Atmospheric Sciences . Preparing an ozonesonde for launch. The University of Wyoming team usually arrives on one of the Air Force flights in August. 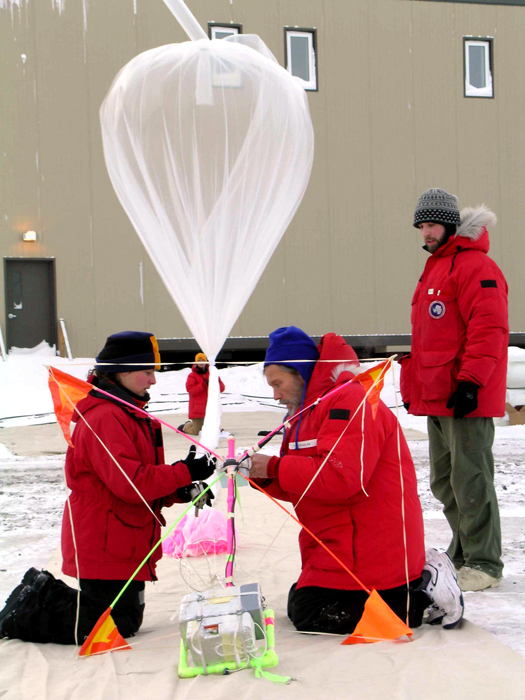 The scientists launch small balloons from McMurdo Station that carry ozonesondes, lightweight instruments that radio information on ozone and meteorological variables such as pressure, temperature and humidity as they soar up to 35 kilometers into the atmosphere. The ozone hole over the Antarctic forms each year in August as the Southern Hemisphere summer begins, eventually dissipating by November. Found throughout the Earth’s atmo­sphere, ozone is particularly rich in the lower stratosphere, a region commonly referred to as the ozone layer, between about 10 and 30 kilometers above the planet’s surface. (The layer of atmosphere just below the stratosphere is the troposphere, where we live and breathe.) The ozone layer blocks harmful ultraviolet rays linked to skin cancer. The hole is the result of chlorofluorocarbons (CFCs) and other chlorine- and bromine-containing gases interacting with two naturally occurring phenomena in the stratosphere. One is the polar vortex, a sort of atmospheric cyclone above Antarctica that is strongest in winter when temperatures are below negative 80 degrees Celsius. The other is polar stratospheric clouds (PSCs), or nacreous clouds when visible, that also form in the extreme polar winter. The PSCs provide an excellent chemical platform for setting chlorine and bromine free to run amok and destroy ozone in the presence of sunlight. The vortex then circulates the ozone-destroying chemicals quickly until it weakens later in the summer. CFCs and other ozone-depleting substances were used in the manufacture of aerosol sprays and refrigerants, slowly creeping from the surface into the atmosphere. However, most countries have largely discontinued the use of CFCs thanks to the Montreal Protocol, an international treaty signed in 1987 to protect atmospheric ozone. Deshler explained that it’s important for the team to make annual measurements of the ozone hole, because these are the years when ozone depletion is peaking and signs of recovery may start appearing. And while manmade chlorine still pollutes the stratosphere, ozone depletions over Antarctica haven’t been as severe during most of this decade as predicted. Deshler said scientists aren’t exactly clear why that is. For example, the years 2002, 2004 and 2007 featured small ozone holes. In 2006, however, the hole reached a record size. One would assume the stratosphere was particularly cold that year, because a cold stratosphere can sustain the vortex, and ozone loss, for longer time. But Deshler said data show the stratosphere wasn’t particularly colder in 2006. “It’s a complex problem because of the meteorology. “There still remain several uncertain aspects of both the atmospheric chemistry and the large-scale dynamics of the annual cycle of the polar ozone holes,” noted Peter Milne, program manager of Antarctic Ocean and Atmospheric Sciences in NSF’s Office of Polar Programs , which funds the study.